See how your home could be even more lovely -- and comfortable -- with your new solar shade. Our MicroCassettes seamlessly blend into the facade of your home. Homeowners choose Worldscreen shades because of their superior ability to block sun, maintain temperature, and provide greater privacy. As a bonus, the virtually invisible MicroCassette headbox almost disappears compared to any other system on the market. Both interior and exterior installations are available, along with our remote-control motorized system that can be operated with timers or sun and wind sensors. In interior installations, many homeowners enjoy the option to conceal shades behind drapery or curtains. 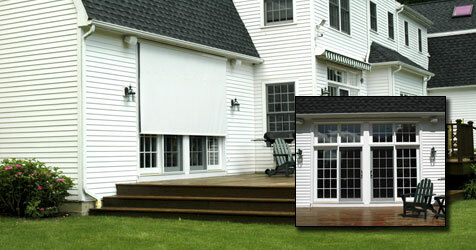 You can order regular or reverse rolls for both interior and exterior shades. Reverse rolls will feed fabric further away from the wall to clear door handles. Contact us for more information about how Worldscreen shading could be the next great addition to your home.